As architecture firms go, few are as typical of Portland as SERA. 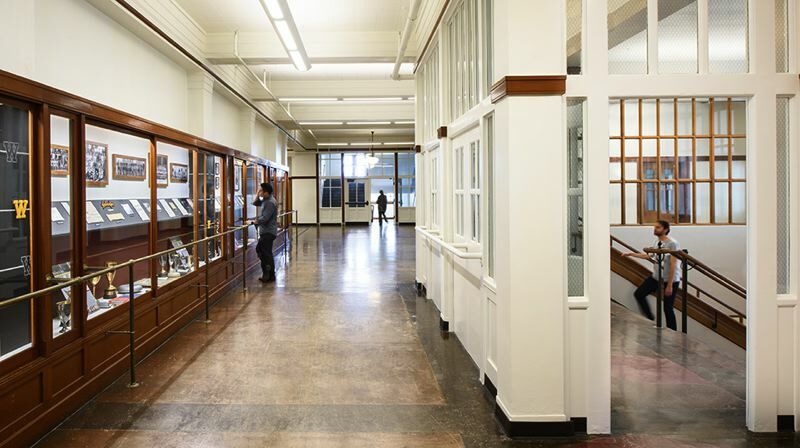 The firm handled historic renovations such as the Pioneer Courthouse, the Meier & Frank building, Washington High School and Montgomery Park. 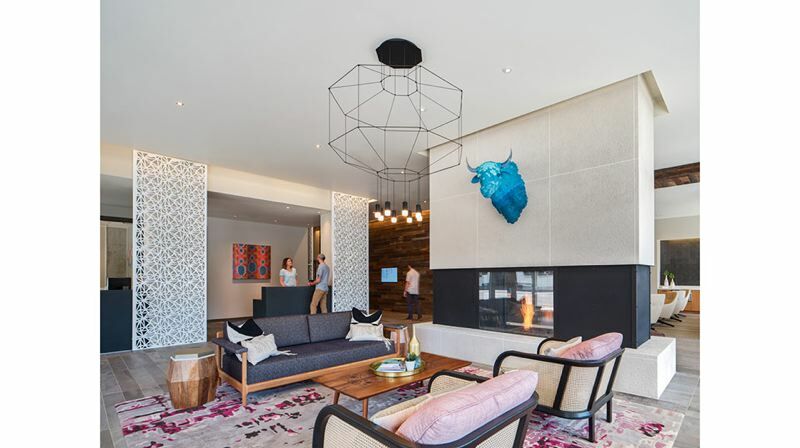 SERA was the executive architect for CO Architects on the Robertson Life Sciences Building & Skourtes Towera in South Waterfront and designed the AC Hotel at Third and Taylor downtown. But SERA is also Portland with a twist for three other reasons: it is 100 percent employee-owned, does a lot of government work while retaining its flair, and exports sustainable expertise to California. Recycling is an Oregon value, from the Bottle Bill to adaptive reuse in architecture. (Taking an old warehouse or school and turning it into offices, homes or a cultural center.) 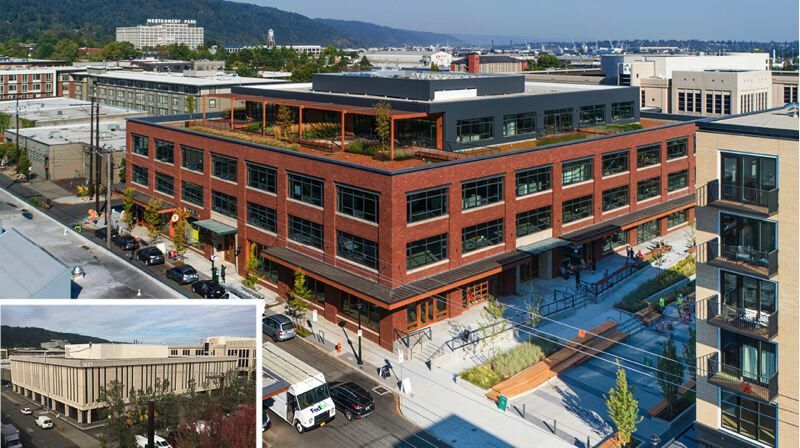 SERA pioneered adaptive reuse in Portland, with such projects as the Galleria, Montgomery Park, Albers Mill, New Market Theater and the Dekum Building. 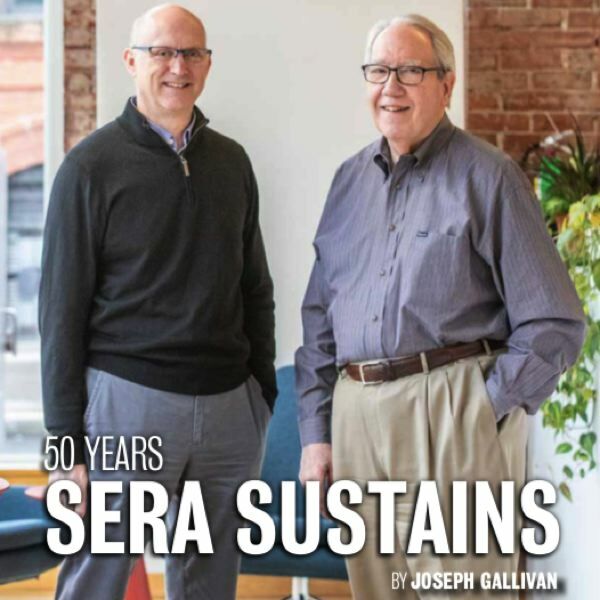 Now celebrating its 50th year, SERA co-founder Don Eggleston (retired) and Kurt Schultz, principal, sat down with the Business Tribune to explain what makes the firm tick. Eggleston says that one way Bill Naito kept his empire thriving was by doing business with his own tenants, so they were strong and could pay the rent. "We were tenants of his in the Merchant Hotel at Second and Davis. Bill had this great attitude of keeping employed tenants. That way you could pay him rent and he would bring the projects in. We had a wonderful working relationship for many years." When he bought the Montgomery Ward warehouse at Northwest 27th Avenue and Vaughn, Naito had incentives. "If you took a whole floor, you got part of tax credit, which reduced your rent," says Eggleston with a chuckle. And when the Japanese-American real estate mogul and philanthropist for whom Naito Parkway is named was looking for an architect for that project, he asked his tenant SERA first. The result was an impressive piece of adaptive use with a seismic retrofit. The building once had trains full of product rolling into it and trucks rolling out, bound for Montgomery Ward department stores. SERA created a sunny atrium and a million square feet of offices, and turned the basement into display space, at a time when Portland didn't have a proper convention center. SERA was the local architect when Ann Beha Architects of Boston remodeled the masonic temple next to the Portland Art museum, adding glass pleats to a windowless hulk that became the Mark Building, the modern art wing of the museum. Those pleats will be removed when the museum builds its new entrance, to be called the Rothko Pavilion. Eggleston does not mind the undoing of SERA's work. "My attitude is buildings need to change over time to meet the economic impacts society put on buildings. Buildings just evolve, like a community." Pioneer Courthouse, however, was different. SERA "base isolated" the building, removing the a post office and returning it to its historically accurate condition. It is the seat of the United States Court of Appeals for the Ninth Circuit. The 1875 structure is the oldest federal building in the Pacific Northwest. "Certain buildings have historical value and shouldn't change over time," he says. In mushrooming Portland, ongoing SERA projects include the United Way block at Southwest 11th and Alder, and a mixed-use tower on the site of old Jimmy Mak's jazz club at Northwest 10th and Davis. But when Eggleston tells the story of a building, he brings to life the social and economic forces that people don't see just as mere onlookers. A.E. Doyle's Meier & Frank Building at 621 S.W. Fifth Ave. was really three conjoined buildings, built in 1895, 1915 and 1932. "The city of Portland was afraid of losing Meier & Frank as a retailer, leaving a gap between Nordstrom and Pioneer Place. They asked us What can you do to preserve it?'" The answer was a hotel. For The Nines hotel, SERA cut in an atrium, which gives internal facing rooms a view. It came about because SERA went back to its partner KPFF and figured out how to do the necessary seismic upgrade. large, historic building downtown for a hotel. We were like, 'We've got a building for ya!'" During that four-year gap there was great uncertainty. Federated had all its Meier & Frank buyers on the top two floors and started moving them out. The city was worried about what that would do to the vitality of downtown. They considered apartments before Sage showed up. That relationship with Sage continued as SERA started working on the Marriott Courtyard, which led most recently to the AC Hotel. "It's about working for people, doing a good job and transferring those relationships. And," he says, noting his own retirement, "Letting others take it and run with it." He acknowledges the irony of trying to save half the building with a Macy's department store, when online shopping came along and devastated brick-and-mortar shopping. He admits his own wife doesn't particularly like going into stores any more; she shops online. If it seems like SERA has always had an "in" with government, it was hard won over time. The firm successfully worked with government on public buildings, such as Portland City Hall, an office building for the Department of Veterans Affairs, as well as a series of IDIQ (indefinite delivery/indefinite quantity) contracts with GSA through which they built many relationships with GSA staff. SERA already knew the building and was well placed to bid when the Edith Green-Wendell Wyatt Modernization Project came up. It was go big or go home time: they reskinned the 1974 tower, reformatted the floor plates and made the mechanical system LEED Platinum rated for energy efficiency. 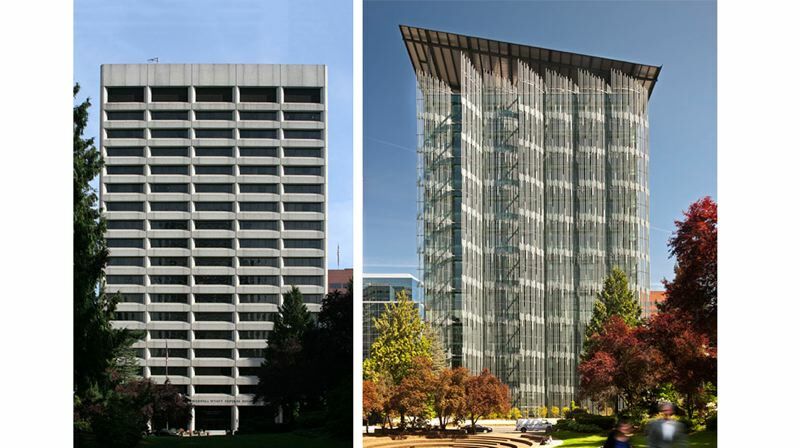 The fact that the work on the Edith Green-Wendell Wyatt Federal Building was paid for by the Obama stimulus package (the American Recovery and Reinvestment Act) allowed SERA to weather the Great Recession better than some Portland firms with shallower roots. The GSA paired SERA with Cutler Anderson Architects, the Design Excellence Architect, of Bainbridge Island. "Jim Cutler had never done a high rise but he had the credentials. It worked as a combination of us knowing the building and Jim's design excellence." Portlanders might be familiar with one of SERA's first works, Black Butte Ranch near Bend. "It started with Bing Sheldon being adventuresome, taking opportunities, like in Bend, then reaching for other projects," says Eggleston. Eggleston says the company approach to clients was always "We're there to help you solve your problem." That could be anything from personal politics to actual architectural work. They began every big meeting by going around the table asking people, as an icebreaker, "What's going on in your life today?" "If you start by knowing what's going on and you know what they're doing, it strengthens the relationship." Another house rule was: Never let an email string go more than three emails without picking up the phone to talk to someone. 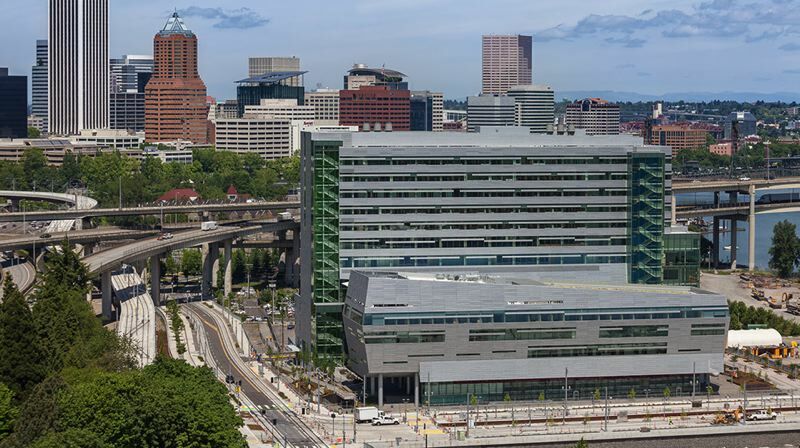 The colocation of ACE professionals at the Federal Building and OHSU's Collaborative Life Sciences building worked, he believes, because of easy face-to-face interaction. "We've always been a very urban focused firm, particularly on urban Portland. The neighborhood is more important than the individual building. We try to repair the city fabric and create sensitive infill. 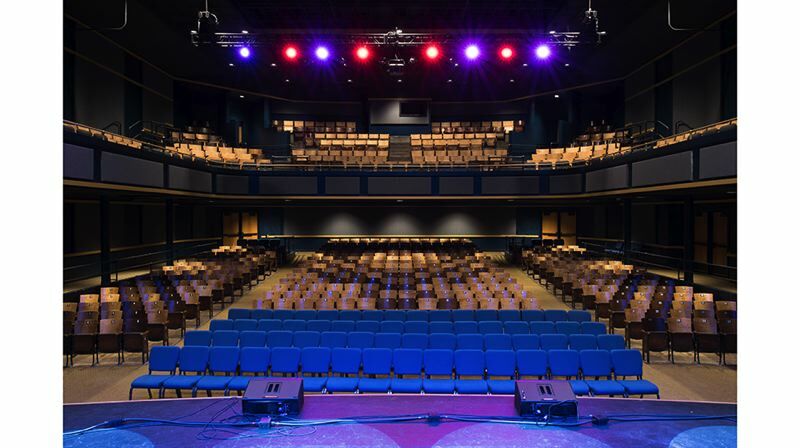 We try not to have an overarching style, we're about what right for that location." For example, the Leland James building in Slabtown was a windowless data center for the Con-Way Trucking firm. They stripped it down, added windows and a penthouse, "Trying to knit it back into the Slabtown neighborhood." SERA is doing three more blocks in Slabtown: the old George Morlan plumbing site, and Saltwood North and Saltwood South in summer 2019. Schultz says the firm is multidisciplinary with experts in architecture, interiors, urban design and planning, as well as sustainability. That helped them through the recession, too. Eggleston adds, "We were fortunate in 2008 to have the Edith Green project. We did not shrink. The profession lost a lot of people, they left Oregon, or left the profession. That's why it's taken the profession a long time to recover. We're fortunate that we've had a lot of people transferring in from out of state." Architects are like canaries in the coalmines for recessions: they get cut first. SERA always plans for recession. "The only way is to be as diverse as we can, working in as many market types and geographic locations. We try not to put our eggs all in one basket of development or city." Architects are at the mercy of developers. Schultz has presented his ideas for Centennial Mills, a mile up the river by the Fremont Bridge, but he can't do anything until Prosper Portland and the prospective buyer, the Lynd Company, finish their due diligence. "We haven't started the team yet. We will commence as soon as they sign the deal. Don't count on it till they ink it," declares Schultz. The company also exports Oregon sustainable know-how to California. They have a second office in Oakland from where they do Bay Area work, including for "large technology clients" whom they can't name. Schultz adds, "There's a lot of demand for Portland urban design and sustainability thinking in other parts of the country, other cities haven't caught up with us yet. All the urban designers and architects had that knowledge in Portland. So it's an export...Particularly in the Bay Area where cost of housing is so high, all those forces mean they need our help." Becoming 100 percent employee-owned was Bing Sheldon and Don Eggleston's idea in the 1980s. "That came out of some research Bing had done," says Schultz. "How you might expand the ownership of the firm without going through the traditional ways most professional service firms do, where you get rid of money at the end of the year to avoid paying taxes then you hope you get your receivables in at the beginning of the year, and to bring other partners in you bonus them out." They felt there had to be a simpler way. "Employee ownership doesn't happen overnight, but to make a stable base for the firm in the long run, which also creates a financial base for the firm to invest money in other opportunities, buy your own building or bring other people in, expand...It's a different method of getting people more invested in the firm." "This ensured that leaders in the firm ascended based on skill and merit, and that the culture and legacy would be passed on. And by making SERA an ESOP — Employee Stock Ownership Trust — employees are also provided financial incentive to contribute to the firm's long-term success in the form of privately-held stocks." Schultz says it's worked well. "Everyone really appreciates it, it's great for employee retention." They have employees who have stayed there for more than two decades, which is rare in a cyclical business where people break off and form new companies. And there's no room for starchitects at SERA. He says the company culture is "sustainable urbanism, doing smart growth and respecting our employees. We're a collaborative firm, more horizontal than most."